Tim Henry, of Las Vegas, seeks shelter in a local warming center as he makes his way south. In a dim-lit corner of the Salvation Army gym, a few men huddle around the low hiss of a radio. They have spread blankets out on the hardwood of the basketball court. In dingy sweatshirts and tattered shoes, they lie propped up on their elbows as the radio announcer calls out the play-by-play of Monday night's Seahawks game. Coming in from the evening cold, other homeless men unshoulder their bags with relief and sign in for the night at the temporary warming center on Indiana Avenue. Dressed in stained layers and unshaven, the men pick from a stack of blankets and claim open spots along the wall. Most have stayed at the center before. Others come for the first time. As the temperature drops into the low 20s, they share quiet cheers over each Seahawks first down. Shawna Sampson, the social services director for the local Salvation Army, welcomes in each new arrival. After waiting outside for the doors to open at 8 pm, many will roll out their bedding and go straight to sleep. "They've been out in the weather all day, on their feet all day, kind of in survival mode," she says. "When they get here, they're just exhausted." 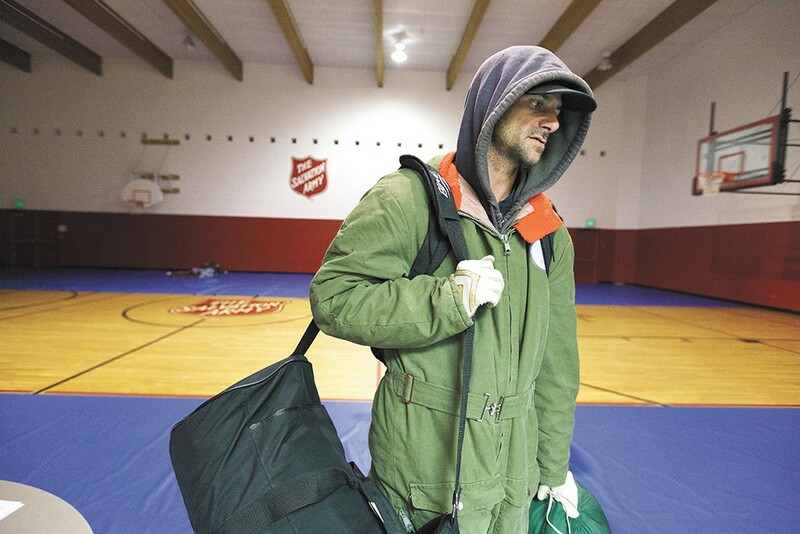 Since 2005, the City of Spokane has funded emergency warming centers to house its homeless citizens during the coldest of nights. Local charities have expanded the service this year to provide more space on a more regular basis. Centers have already opened for more nights this winter than the previous two years combined. With the weather forecast falling into the single digits this week, Sampson says accommodations at the warming centers may be minimal, but they can also be potentially lifesaving. "It's really about harm reduction," she says. "The objective is to keep people safe." Dozens of homeless men and women take advantage of the warming centers during the city's worst weather. The Salvation Army now oversees the largest center, housing single men, as well as the nearby center for couples and families. Hope House, on Third Avenue, operates a similar center for single women. The centers remain open from 8 pm until 7 am. Sheila Morley of the city's Community, Housing and Human Services department, the program's manager, says her office activated the centers just three nights in both 2011 and 2012. But they have changed protocols this year to open the centers on additional nights. "We want to make sure people are in a safe and warm place," she says. City officials have extended the temperature threshold from 15 to 20 degrees, allowing for more openings. Another change centralizes operations with the Salvation Army instead of using alternating shelters downtown, which proved less consistent and potentially confusing. Early estimates suggest the centers could open as many as 30 nights this year, depending on the weather. Morley says the city has budgeted a little more than $27,000 for the program this season. She sees a busy week when she checks the forecast: "Looks like we're hitting a cold spell." In the Salvation Army gym, Sampson goes over the rules with a man in a black baseball cap and jeans. The most important rule is respect. Be courteous to the staff and the other guests. Someone can come in drunk, but they can't drink while there. Once you're checked in, you must remain inside for the night, she explains. No weapons. Dogs are allowed. Bikes are OK.
"They're pretty good," she says. "We haven't had any incidents yet. Knock on wood." The man nods along and quietly asks for a sandwich: "I haven't ate all day." The men's center does not serve food. Sampson says the center is still getting organized. They have had a hard time finding people to staff the overnight shifts; many employees stay on after working all day. "We've been making do with existing employees," she says. "We've been kind of struggling to get caught up." In a neighboring building, Glenn Brock and his wife Carrol Ann Harvey-Brock check in at the couples and family warming center. They spread several wool blankets out on the linoleum, then pick through a box of snacks on the counter. "We both came down here to get out of the cold," Carrol Ann says. "This is a good place. I've heard a lot about it." Carrol Ann Harvey-Brock and her husband enjoy soup at the family warming center. Glenn heats a cup of tomato soup in the microwave. His narrow chin is accented by a sharp goatee. He keeps his beanie pulled low on his forehead. He says he has been homeless for about eight years. He stays where he can, but this is his first night at the warming center. Carrol Ann has bright eyes and a tattoo of a flower along her left cheek. She says she sometimes stays with family, but Glenn's not always welcome. She'd rather brave the cold than be apart. As they sit on their blankets spooning soup, they offer their thanks for the open center. Carrol Ann says it brings her peace to have a warm floor for the night. "It's a good place," she repeats. "It's very beautiful." As the hours pass, more people file into the centers, dragging backpacks and plastic grocery bags of clothes. Sampson notes she has seen most of them before. Many know each other from their time on the streets. "A lot of the same faces," she says. "You get to know their names. ... They're an interesting group." Sampson likely will work multiple late shifts this week to keep the center open. In previous years, the centers have drawn as many as 70 people in a night. She can't say how many they may see this week, but they will take in everyone they can. "You do what you got to do," she says. "This is important." A young man from Las Vegas walks in tentatively. Tim Henry says he hopes to hitchhike home, but for now he has nowhere else to go. He collects his blankets and heads for a quiet spot against the wall. "I am really, really tired," he says. He drops his bags and slowly strips off his gloves, one and then the other. He sits to untie his shoes and kicks them off. Pulling back his cap, he scratches his scalp and pivots into his bedding.